Today, we commemorate the 74th anniversary of the D-Day landings in Normandy. On June 6, 1944, Canadian and Allied forces bravely fought their way through a heavily protected coastline in France, to secure beachhead against the Nazi regime. Of the nearly 150,000 soldiers who landed, approximately 14,000 were Canadian. By the end of the day, troops of the 3rd Canadian Infantry Division and the 2nd Canadian Armoured Brigade had advanced farther inland than any other Allied force. The fortitude, determination and success of Canadian soldiers will forever be an enormous source of pride. 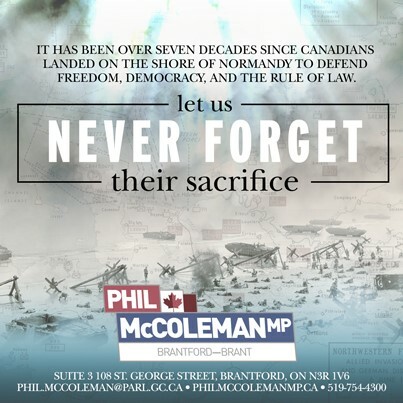 On this anniversary, let us remember and pay tribute to Canada’s veterans who served so courageously at Normandy. We are eternally grateful for their tremendous sacrifice.